X-rated anew on Fox: truth-seekers Dana Scully and Fox Mulder. It had begun to seem as though a continuation of The X Files on Fox was about as likely as a 24 feature film. Lots of false starts but no payoff. 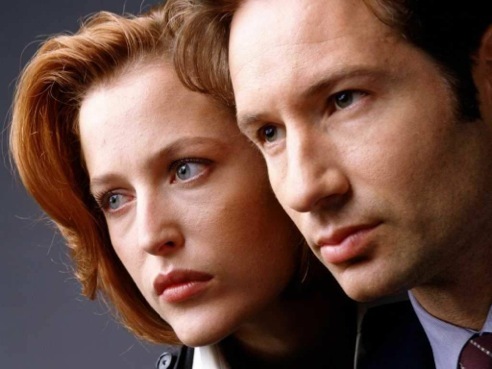 But a renewal of the famed sci-fi series is now an officially announced reality, with David Duchovny and Gillian Anderson reuniting as Fox Mulder and Dana Scully in a six-episode “event series.” Creator/executive producer Chris Carter also is returning as show runner, Fox said Tuesday. Production is scheduled to start this summer. The X Files premiered on Fox in September, 1993, ages before Facebook, Twitter and the whole social media upheaval. It nonetheless became a much-talked about phenomenon in those primitive times. The series ran for nine seasons and 202 episodes while also spawning two big-screen films starring Duchovny and Anderson. Showtime has ordered 12 episodes of Billions, a new drama series starring Paul Giamatti and Damian Lewis, who will be returning to the network after three seasons as the ill-fated Nicholas Brody on Homeland. The network describes it as a “complex and contemporary drama about power politics in the New York world of high finance.” The series is due in 2016, with Giamatti playing “hard-charging, politically savvy” U.S. attorney Chuck Rhoades and Lewis cast as “brilliant, ambitious” hedge fund king Bobby “Axe” Axelrod. Besides Don Draper’s last stand, here’s what else is coming on Easter night. *PBS’ Wolf Hall, a six-part Masterpiece presentation starring Mark Rylance as Thomas Cromwell and the aforementioned Lewis as Henry VIII. *HBO’s Sinatra: All or Nothing At All, a two-night, four-hour documentary on the legendary singer. *NBC’s American Odyssey, an ambitious, Homeland-like drama series delving into global politics, corporate espionage and military skullduggery. *Lifetime’s The Lizzie Borden Chronicles, an eight-episode continuation of the network’s hit movie starring Christina Ricci in the title role. *NBC’s A.D. The Bible Continues, post-crucifixion sequel to the History network’s The Bible.